Snowboard bindings are the link between your boots and your board and are therefore an essential part of a snowboarder’s kit. Conventional strap-in bindings – these remain the most popular type of binding and are by far the most common. They consist of a toe strap and ankle strap that holds your foot in place against a calf support known as a “back plate”. They take a little longer to strap into than other types and you’ll need to sit down to do it, but they are considered to be the most reliable, comfortable and adjustable, and are the market standard. Step-in bindings – these require a special type of boot, but have the advantage of being quick and simple to attach. They are especially popular with ski resort snowboard schools because they are quick to get in and out of, and very easy to adjust - perfect for beginners. These come with or without back plates. The downsides to step-ins are that they can become clogged with snow which must be removed before the boot can be attached and also the boot that they require is heavier than a normal boot. Flow bindings - a cross between conventional bindings and step-ins, these combine the support of strap-in, with the speed of step-ins, and a normal soft boot can be used. Flow bindings look similar to strap-ins, but have one tongue-like appendage which covers the entire top of the boot, rather than two straps. The disadvantage of Flows is that they are a little more fiddly to adjust compared to strap-ins and step-ins. Plate Bindings (also known as hard boot bindings) – are used by carvers and alpine racers. For this type of binding a hard boot must be used, which provides the support, (the binding just attaches the boot to the board). They are more similar to ski bindings than the other types, but do not release automatically in the event of a fall (like ski bindings do). Plate bindings are highly responsive, allowing prescion control of the board. Bindings come in different sizes, so those with large boots will need bigger bindings. Some boots are particularly chunky or slim and may require a smaller or larger binding. The main difference between conventional bindings is the material used in the construction.High end models tend to use lighter materials, which are also less forging therefore more responsive. Lower end bindings are heavier and a little more flexible, which normally suit beginners. 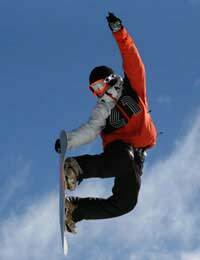 Freestyle bindings tend to have lower “back plates” – which allow a greater freedom of movement, thus aid the performance of tricks. It’s a good idea to buy boots and bindings at the same time (or at least boots first). Aside from getting the correct fit, this will also allow the style conscious to get that all important colour coordination, and you may find you get a better deal than if you buy separately.